Over 500 million people are members of LinkedIn and, of those members, 40% use LinkedIn daily. There’s no doubt that it’s a powerful and robust network for professionals the world over. From a B2B perspective, it’s a marketing gold mine. And for working professionals looking to network and find jobs, it’s the place to be online. 61 million LinkedIn users are senior level influencers, and 40 million are in decision-making positions. But how do you get the attention of these individuals and stand out from the masses? 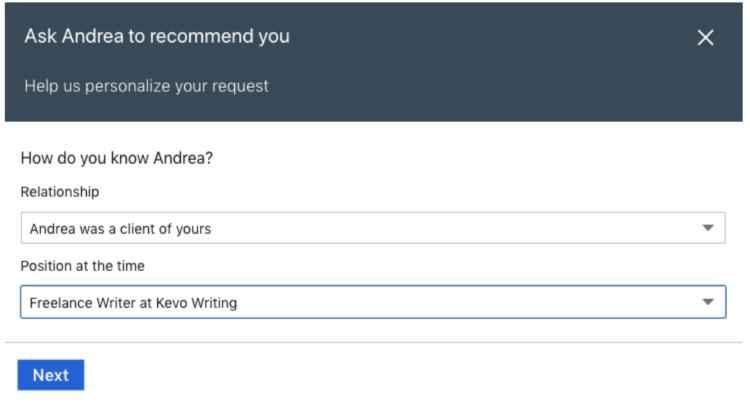 One of the best ways is by making the ask for LinkedIn recommendations. search, and finding new people to add to your network. There’s just one problem, figuring out how to ask for LinkedIn recommendations. profile, click “Ask for a recommendation” and fill out the online form. Then, voila! getting results and putting your LinkedIn profile at the top of searches. There are a few steps you need to take. that would be highly valuable to potential employers. material way from your work. who has a network with a target audience you’d like to attract. from individuals who see you in a positive light and can write well about you. that you’ll need to spend some quality time on. personal and gives you the opportunity to influence what your reference says. assignment. You have to give to get. references to common projects, experiences that you share. night to get project X done for a client at the last minute? work we did. Good times. collaboration on Y. Just three to five sentences would be perfect. recommendation for your profile as well. Hope to hear from you soon. go beyond email and send a thank you note via snail-mail or through an e-card. Even a small gift could be a great idea. 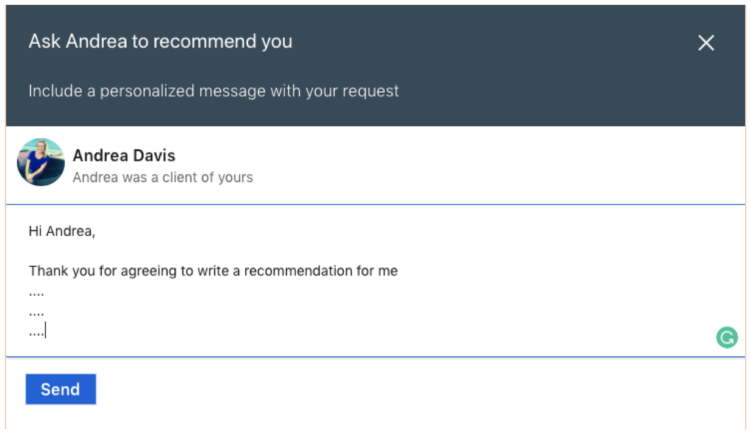 Now that you know how to ask for LinkedIn Recommendations correctly, don’t be afraid to go out there and start asking. 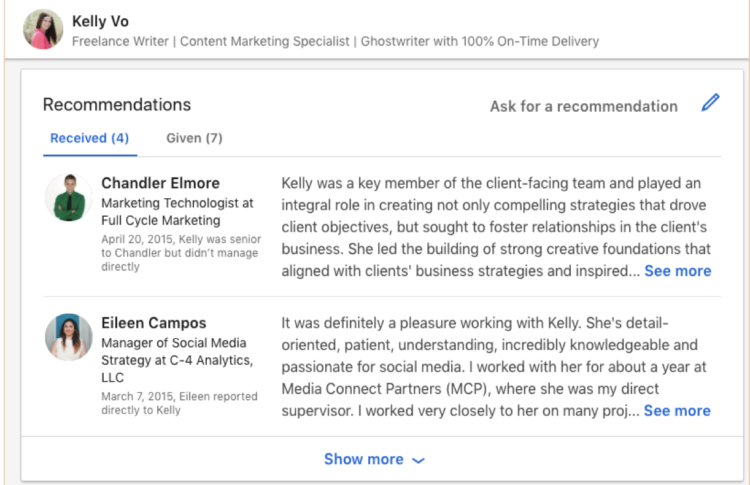 The best LinkedIn recommendations can drastically improve your online brand by sharing compelling evidence of your skills and talent. Looking for More Help with LinkedIn?